At this time of the year, fishing in Alabama and some of the southern states can be tricky as not only is the air temperature hot but so are the waters. With most waters averaging in the 90 degrees, tournament angling becomes not only about finding the big ones but how to keep them alive. Our Rod Glove Pro Staff John Causey experienced these conditions fishing in Alabama in the Alabama Bass Trial as this summer records have been broken globally with heat waves. With such hot temperatures, tournaments take place during the spring and early summer months with a break over the hot months of summer. The fishing season starts up again in October and the Championship for the Alabama Bass Trail is scheduled at Lake Eufaula with many teams in contention. The main key to fishing Lake Eufaula is to find the bait fish and the large bass should be relating to the bait. 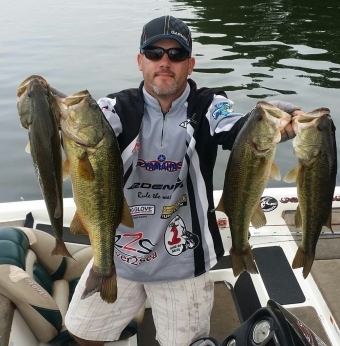 A series of shallow water lily pad fields and weed beds that have deep water close by and by throwing topwater buzzbaits or frogs should do the trick. John started fishing from ponds in Alabama and when he was 16 yrs old he got into tournament angling with his local BASS club and at such a young age, was fishing from a Skeeter bass boat with a 115hp. He was such a great angler that he ended up in a Top 12 finish with BASS Federation. He has been fishing for the past few years with the Alabama Bass Trail and says it's a great tournament series with a Phoenix boat as the main prize at the end of the Championship. John's favourite place to fish is the Alabama River and in the deepest part it is 25'.